Teach Your Pup How to Give You a Kiss This Valentine’s Day! Valentine’s Day will be here before you know it, so we think it’s only fair to talk about how you can teach your pup to give you a smooch this Valentine’s Day! 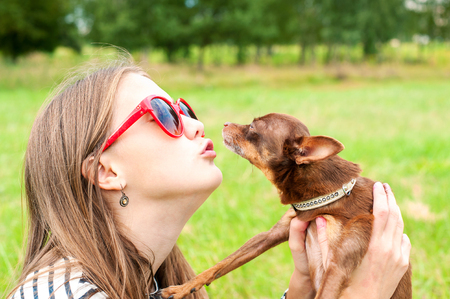 Giving kisses on command is a favorite dog trick for many people, especially kiddos! Teaching your dog to give you kisses also happens to be one of the easiest tricks you can train a dog to do. To begin, take a dab of peanut butter and place it on your cheek to encourage your dog to lick your face. Be sure to have a few dog treats nearby, so you can reward your dog when necessary. Make sure your dog is sitting in front of you, lean into your dog and offer your cheek. Say the cue phrase such as “kiss” or “give kisses.” When your dog expresses interest in licking your tasty cheek, say “yes” or “good girl/boy” and offer a dog treat as a reward! Practice this fun trick a few minutes, several times a day and before you know it, your dog will come over to you and give you a big sloppy kiss every time you give him a command. Some dogs get a little over excited, and once you teach them to give kisses it might be hard for them to stop. When your dog is kissing you, tell him “enough.” Wait for him to stop licking you and then say “good” and give him his favorite treat. Also, some dogs are resistant to giving kisses on the face. If this is the case, train him to give kisses somewhere else, such as your hand, and use the same steps above. Are you looking for a new pup to love and train this Valentine’s Day? Visit Pauley’s Pups today or call 804-798-7977 with any questions you may have about our toy and small dog breeds that we currently have for sale! Happy training and Valentine’s Day!